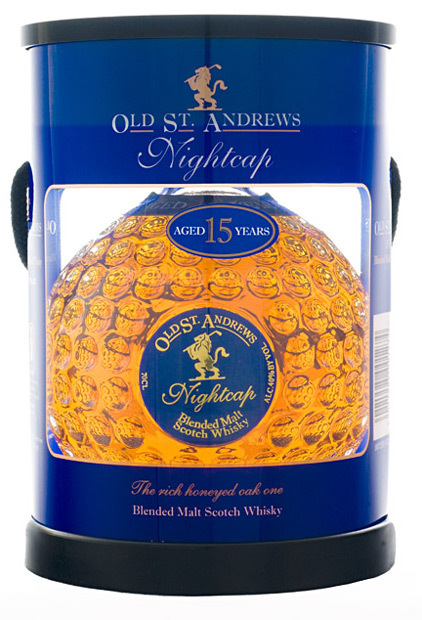 Old St Andrews, purveyors of blended Scotch whisky in fancy golf ball inspired bottles, produce the Old St Andrews “Nightcap” 15 year old. Old St Andrews “Nightcap” is a blended malt Scotch whisky that contains malt whiskies that have been aged in European oak casks for at least 15 years. A number of Old St Andrews bottles have sat collecting dust in many liquor cabinets I have seen, never to be opened. The bottle design, which admittedly looks pretty spectacular when the light catches it the right way, means that Old St Andrews has always had a reputation – at least in Australia – as a “display bottle”. Many people buy Old St Andrews for the bottle, not the whisky. That is a real shame, because having just tasted it I can say that the Old St Andrews “Nightcap” 15 year old is one of the better blends I have tasted. The nose is rich, aromatic and vibrant – a fusion of vanilla, honey, flaky baklava, crushed nuts, preserved cherries, icing sugar, brown vinegar preserved plums with raw sugar and fruit pie fills the glass with undertones of anise alongside piercing spices and the warming burn of fresh chili and drying yellow plum. As the whisky rests, more pronounced coffee notes emerge with raw sugar and chocolate milk splashed over honeycomb, fennel fronds and increasingly denser chocolate. What a fascinating bouquet on this dram! On the palate the whisky is sweet and sugary with reduced brown pear in syrup, browned toffee, cracked cinnamon and heavy layers of rich Navy style rum with sticky molasses, counterbalanced by drying and astringent fruits such as damson plums. The finish offers brown sugar and aged rum notes, as the crystalline sugars emerge with maraschino cherries, coffee drops and the aftertaste of chocolate cake. Overall, Old St Andrews “Nightcap” 15 year old is a whisky that belongs in your belly, not on display. Its smoothness is accompanied by a flavourful malty punch that offers a very distinctive rummy style, crystalline and almost sticky, that is balanced by undertones of drying fruit notes and enhanced by the European oak. At its price, it is great value for a blend of whiskies that have aged for at least 15 years. Old St Andrews have hit this one right on the green. A job well done. Fore! This entry was posted in Malt blends and tagged clubhouse, golf, old st andrews, rum, scotland, sugar, whisky. Bookmark the permalink.